Do you know of any Senior or others that are on SNAP? Please let them know about our program to stretch their food $. We have a program that will match up to $20 on their SNAP card, and give them an additional FREE $20 in TOKENS for Fresh Fruits and Vegetables at our market. Well it sure rained buckets last Saturday. But we were still open from 9 am to noon. We even had 2 new vendors, Rebel Hollow Farm, and Umbrella Blessing Farm. Sorry you all missed us. We had lettuce, goat milk soap, pork chops, lamb, radishes, onions, herbs, eggs, Honey, Sausage, Crafts and more. Unless we get drowned out this coming Saturday, we will be waiting for you at the market. Stay tuned to our Facebook Page for updates and for a list of vendors who will brave the elements on Saturday. We will also try to do a live feed from the market. Vendors will be posting here online as soon as they know what and how much they will have of their products. So keep checking back daily for updates and order online for pick up at the market on Saturday at the information table. Market season is just beginning, and it is going to be a good one. Our new location, The Doak House Museum, located on The Tusculum College Campus, is a beautiful setting. As things come in, you will find them listed here, for pick up at the market on Saturdays. Keep checking back each week to see what might be available. Take a look under Bath and Beauty for a One Time Only Massage Therapy AT Special for Mothers Day. A 20 Minute Chair Massage for that special mom in your life for only $10. Order now, only 6 available. We’re excited to begin another season of produce sales at the Greenville Farmers Market. As many of you are now well aware, we’ll be located at the historic Doak House Museum on Tusculum Rd. This past week, we’ve added one new produce vendor and another who will be selling farm fresh eggs. We’re hoping for a bunch more new vendor signups before opening day arrives, so if you’d like to sell, please call Judy Shelton at (423) 552-3023 to learn about becoming a vendor. Here’s To All the Moms! As Mother’s Day 2018 falls on the Sunday following our Market Opening Day, we’re going to be celebrating moms at the market. Bring a mom, buy a hand-made or locally-grown gift for your mom, or if you are a mom— come have a great day with us at the market. We hope to see all you moms there! As always, with a new week, our Online Market is open and ready for business. Have a great week everybody! Here’s to Spring sticking this time! 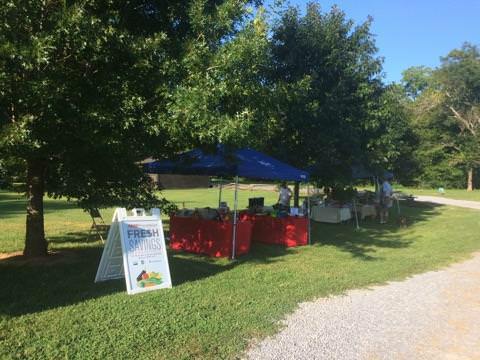 Greenville Farmer's Market is Back and Better Than Ever At Our New Doak House Museum Location! Come out to the scenic, serene and historic setting at the Doak House Museum, conveniently located on Erwin Hwy in Tusculum. This season’s opening day is Saturday, May 12th. Come explore our wide assortment of vendors’ offerings every Saturday from 9am until 1pm. Our exciting produce selection and excellent hand-crafted goods will be available every week, all Summer long, through the month of October. We’ve chosen the Doak House for our new location due to the wonderful, natural setting, easy and free parking and for the great space it provides our vendors and shoppers. As many of you know, The Doak House Museum is a historic landmark in Greene County. To learn more about the Doak House’s interesting history, click here. You’ll want to visit the Greenville Farmer’s Market every Saturday all season long, as the vendor assortment and offerings will change from each week to the next. Expect a delicious and nutritious selection of seasonal produce, vendors offering hand-made craft goods, baked goods, and the work of local visual artists. We’re looking for additional vendors. Come sell your wares! All we require of our vendors is their commitment to selling only self-produced produce, crafts, and goods. Please, no resellers! There is no garden too small. Our shoppers love locally grown produce, and you just might have that one crop nobody else is offering. You can sign up to be a vendor via our online vendor application (click here). We’re currently accepting applications for year-round as well as special event vendors. For more information about becoming a vendor, please call Judy Shelton @ 552-3023. Vendors must provide their own tents, tables, table coverings / skirts, chairs and trash receptacles. The Greenville Farmers Market is excited to continue in its 24 years, with our greatest shopping experience ever, thanks to our new location at the Doak House Museum. You’ll find our location very easily accessible from the Downtown Greenville area. Simply take Old Tusculum Rd. to Erwin Hwy, turn right and look for the Doak House on your right. We hope to see you all out there every Saturday, all Summer long! TIME: 9 AM TO 1 PM. The Online Market is now open for the week. Check out all our goodies available here online. Our physical market opens May 12. Don’t forget we have moved to The Doak House Museum for the physical market. It’s a beautiful locations, under the trees. We are all excited and are looking forward to seeing all of you again.